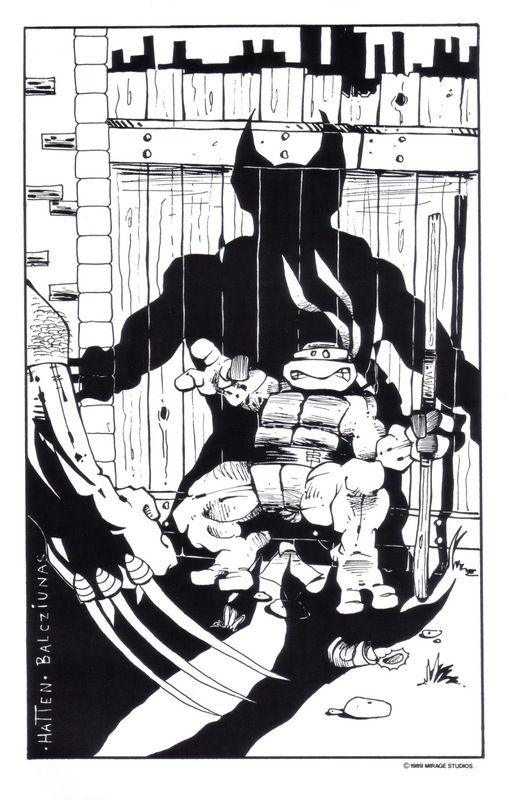 Here's an obscure one that even I had never seen until TMNT fan Adam Winters shared it with me yesterday. It can only be found in the 2nd printing of TMNT (Vol. 1) #7 published January, 1989. The piece is by a duo I can only identify as "Hatten and Balcziunas". And it is Donatello having a showdown with Wolverine (or a legally acceptable vague likeness). Peter Laird's opening editorial for the 2nd printing doesn't even mention the new pin-up (hence why I don't know the first names of the artists), so it's pretty easy to miss. They did a good job capturing Kevin Eastman's style on Don, though. And I just now noticed that Donatello doesn't appear to be wearing his knee or elbow pads in this piece! Why is that so that everytime Turtles are shown in crossover situations, that they get their shells kicked (there was somewhere this Spawn vs TMNT story)? I mean come on, Wolverine should be the one who is shaking in fear. Great catch, Adam. I wonder why they chose Donatello..
@Mark: Unrelated, but is TMNT #24 running late for you? I think TMNT #24 has been delayed to the 31st for everyone.